MIGNONNE: Ends December 11th! Don't Miss the Mignonne Giveaway on Apartment Therapy!! Ends December 11th! Don't Miss the Mignonne Giveaway on Apartment Therapy!! 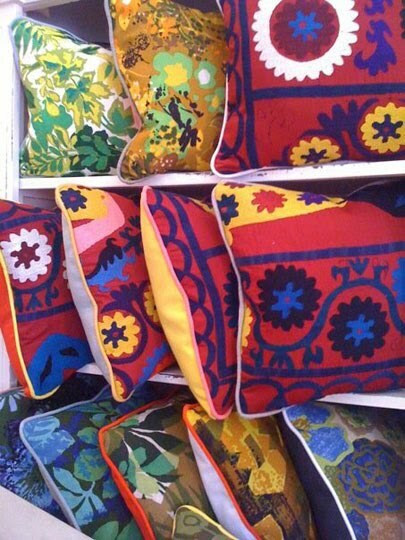 Yes, you can win some of our amazing, handmade pillows using one-of-a-kind, rare and collectible vintage textiles!! These beautiful pillows are made with the quality you expect from Mignonne ... with all of the extra details that set them apart from the big-box, factory style producers. Our pillows are handmade covers with zipper, and a separate down insert. This means they can be removed and cleaned when needed ... maintain them with care and they will last for years. One pillow utilizes very collectible Suzani fabric, linen, and zipper covering a down-filled cushion. Another pillow utilizes original 1960s vintage textiles in new condition, linen, and a zipper covering a down-filled cushion. The signup for this giveaway ends December 11th, so hurry and CLICK HERE FOR THE LINK to enter for your chance to win the pair! Yes that's right, THE PAIR!!! *please note, Apartment Therapy limits participants to residents of the U.S. only, one entry per person.